Using the PayPal integration functionality in AccountSight, users can provide the option to their customers for seamless and instant online payment of pending invoices. PayPal ensures a secure and direct money transfer from the customer to the user’s account which essentially reduces the instances of late manual payments and helps users manage their cash flow efficiently by reducing accounts receivables. A prerequisite for using the PayPal integration is to have a PayPal business account so that payments can be made directly online to that account. The user must configure his/her PayPal account in AccountSight in order to implement this feature effectively. 1] Login to the AccountSight account as Admin and go to the Settings tab. 2] Within the Settings tab, go to the Invoices sub tab. 3] Click on the PayPal Payment section. 4] Click on the icon to configure your PayPal ID. Enter your PayPal ID in the text box and click on Update to save the change. 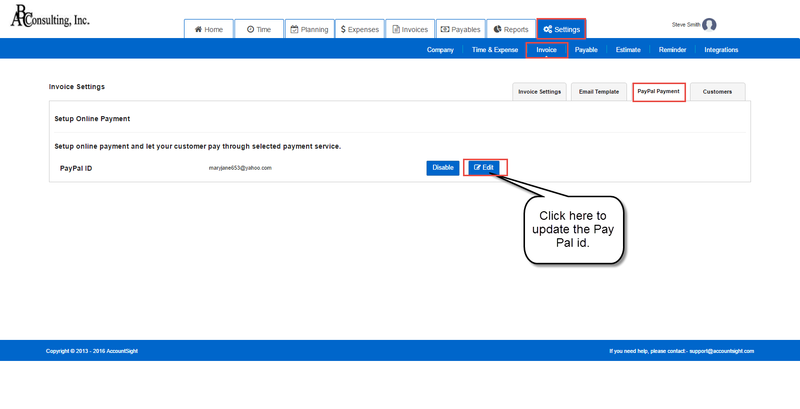 5] Now click on the Enable button to activate the PayPal feature. Once you enable this feature, customers will receive a PayPal link inside the invoice emails. They can click on that link and instantly pay the bills via PayPal. 6] To deactivate the PayPal feature and continue the manual payment method, click on the Disable button.